I know, I missed last week’s post. Would you believe I’m still working on it? In the meantime, I’d like to share something ridiculously delicious. TD and I have been experimenting with the bounty of summer fruits and vegetables available this time of year. The following came out of a trip to the farmer’s market and a lazy Sunday evening. We started with a base of white balsamic and olive oil (we use a basil infused olive oil available in bulk at Whole Foods). Next, one large tomato chopped into 1/2 inch chunks. Allow it to drain in a colander with the help of a sprinkle of sea or kosher salt. Give the whole thing a shake every few minutes to release the tomato juices (into the sink). The next two piece can be done on the grill or stove-top. 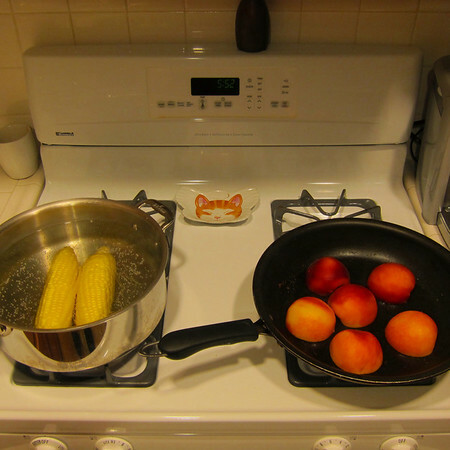 Boil some corn and sear some stone fruit. 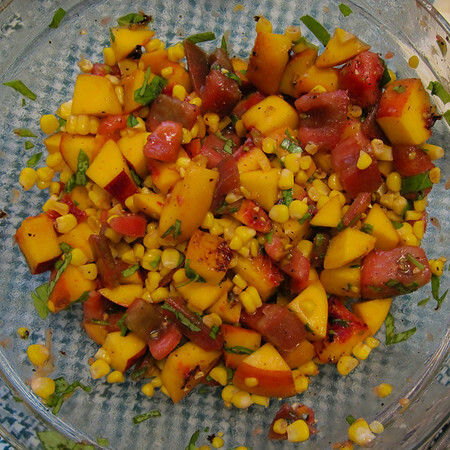 Here we’ve used yellow peaches but white peaches, nectarines, plumbs or a combination would fit the bill. To sear, I gave each half a light coating of olive oil and dropped it into a hot pan for about 90 seconds. Basil is absolutely necessary here. Trust me. We’ve tried the cheese two ways. Below, we’ve used fresh baby mozzarella. It works really well. But, if you want to take things to the next level, use burrata. Burrata cheese and stone fruit together will change you life. If using the burrata, don’t mix it into the salad. Plate the salad and then let people dribble their own over the top. Finally, if you dare, cook up a couple of pieces of super thin prosciutto. Let it get nice and crispy, then give it a fine chop. Set aside to sprinkle over the salad right before serving. Salt and (liberal) fresh cracked pepper to taste. 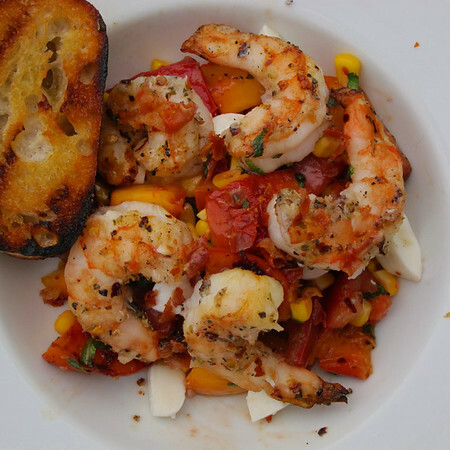 This can be served as a colorful side or add-in grilled shrimp or chicken for a main dish. This stuff is ridiculous I tell you. And, the variations are endless. If boiling corn, set ears in a larger saucepan filled with cold water over high heat. Allow it to come to boil. Drain immediately and set aside for a few minutes. While corn is cooking, chop tomato. Sprinkle with sea or kosher salt and allow to drain in a colander over the sink. 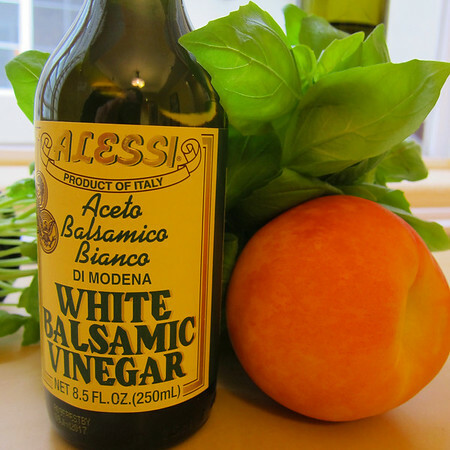 In a large bowl, whisk together vinegar and oil. Halve peaches and brush with olive oil. Heat a large pan over medium high heat, sear, cut side down for 90 seconds. While corn is still warm, cut off-of the ear and add into bowl with oil and vinegar. Add in tomatoes (use a slotted spoon so that the seeds at the bottom of the colander don’t come along for the ride). Gently toss to coat. Gently add-in peaches and basil. Cook prosciutto chop and set aside until just before serving. 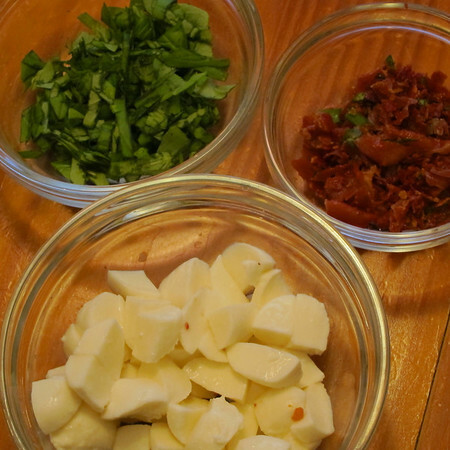 Prepare cheese (when using mozzarella, we cut the little balls into wedges slightly smaller than the tomatoes and peaches). When ready to serve, sprinkle with prosciutto and add cheese. Note, the peaches and tomato will continue to give-off juices. If made more than an hour in advance, be sure to drain-off some of the juices before serving. 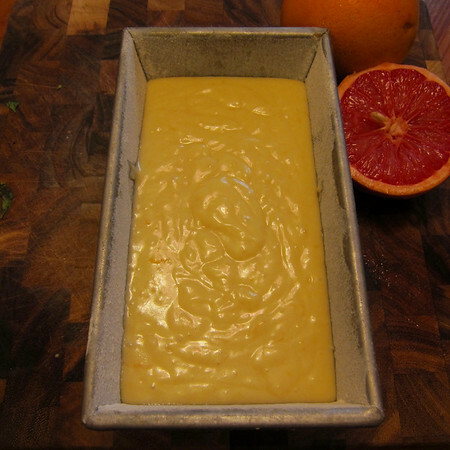 It wouldn’t be January in the Misanthropic kitchen without a grapefruit recipe. In fact, I started thinking about what to make way back in November (I am convinced there is a relationship between losing the light as the year grows old and craving the brightness of vitamin C-packed fruit). This year there were two front-runners. However, as it is my enduring goal to have my cake and eat it too, I decided to use one with a different kind of citrus (to be continued in February) and chose a new twist on an old recipe for my beloved grapefruit. 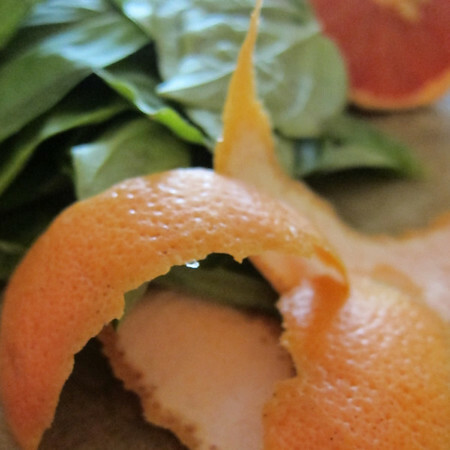 We’ll start with the twist: grapefruit and basil syrup. I know, I know basil is generally a summer flavor. But, I couldn’t shake the idea and so decided that if I could find it at my local, generally understocked grocery store, it might be something others could also find this time of year. For frame of reference, on the day I went in search of ingredients, there were no mushrooms to be found at the store we lovingly refer to as Ghetto Ralphs. But, there was basil. It was on the expensive side. But remember, it’s grapefruit season which means they were practically giving them away. Grapefruit rind+ a couple of cups of fresh basil leaves+sugar and water+heat=the kind of smell you’d like to dab behind your ears. 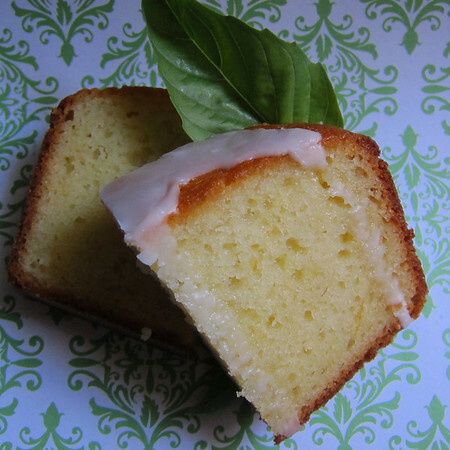 Now for an oldy but a goody, Ina Garten’s lemon yogurt cake. Riffing on a recipe is always easier when you know the original is a ringer. I just swapped-out the lemon zest for grapefruit zest and, because I was feeling adventurous, used a runnier, European style full-fat yogurt. Both substitutions were a success. The loaf on its own is lovely. But, we know the key to this cake is the syrup poured over the top while still warm. 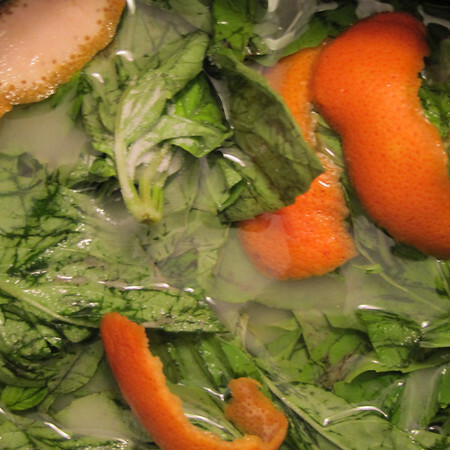 And this is where our basil and grapefruit syrup makes its debute. The result? Refreshing! The basil adds complexity to the flavor without being overwhelming. For an added bonus, the leftover syrup will store nicely in the fridge for a few weeks because really, who wouldn’t want a little grapefruit-basil-vodka cocktail on a Friday afternoon? Bruise the basil leaves bit with your hands to release the oils. Place basil, sugar, water and zest in medium heavy-bottomed saucepan. Turn on medium heat and let it come to a boil and allow the sugar to dissolve. Turn off heat. Allow mixture to steep for at least an hour while it cools to room temperature. Strain syrup through a fine-meshed sieve and store in an airtight container in the fridge for up to a month. Preheat the oven to 350 degrees F. Grease an 8 1/2 by 4 1/4 by 2 1/2-inch loaf pan. Line the bottom with parchment paper. Grease, flour and line pan with parchment. When the cake is done, allow it to cool in the pan for 10 minutes. Carefully place on a baking rack over a sheet pan. While the cake is still warm, pierce cake all over with a bamboo skewer than pour the grapefruit and basil syrup over the cake and allow it to soak in. Cool. 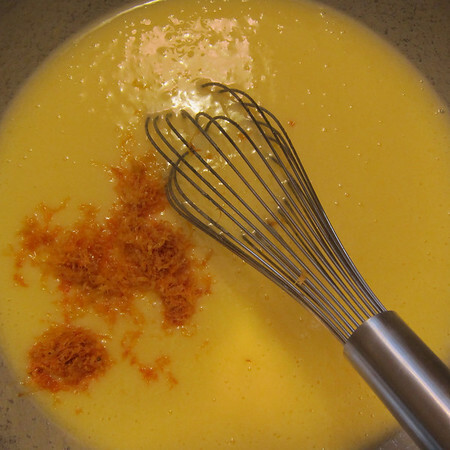 For the glaze, combine the confectioners’ sugar and grapefruit juice to desired consistency and pour over the cake.